The PanScan Freedom from RHK Technology is an award winning, one-of-a-kind closed-cycle cryogen-free system. It offers low drift, excellent spectroscopy performance, consistent temperature performance and atomic resolution. The device is compact, simple, and economical and enables users to study new generation materials. The PanScan Freedom eliminates the costs of liquid helium, complications of dewar switch-out and transfer hoses, hazards of interrupted experiments due to cryogen supply and safety issues related to liquid cryogens. 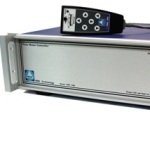 Users can gain all the advantages of LT measurements in a secure and safe manner with a low total cost of ownership. The PanScan Freedom’s symmetrical design automatically aids in compensating thermal drift. Dual thermal shields completely isolate the scan head from the chamber’s room temperature, helping to maintain the scan head at a low and steady temperature. An advanced multi-stage vibration isolation system with a highly optimized vibration damping system is used by the PanScan Freedom. The scan head of the device is extremely stable and rejects any vibration coming from the cryostat and its surrounding vicinity. Performance is not degraded while cryostat is in operation – The Pan Scan Freedom offers exceptional performance with a small footprint. There is no requirement for large pits or soundproofed rooms to achieve outstanding results. The device can run well even in noisy rooms where there are large floor vibrations. The low ownership cost and ease of operation offers a major improvement in all spectroscopy, STM, and AFM measurements. 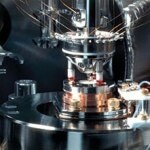 Lower noise, considerably lower drift, better tip and sample stability all significantly enhance productivity. Image virtually anywhere - The PanScan Freedom’s compact, sturdy and symmetric design enables ultra low noise, <1 pm imaging performance. The performance is not hampered even in noisy environments. Proven performance – The key function of the SPM is the visualization of surface structures with atomic scale resolution. 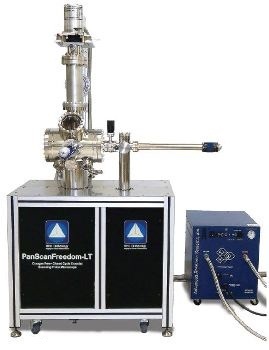 The PanScan Freedom is capable of achieving ultra low noise atomic structures on different types of materials ranging from crystalline metals to carbon nanotubes. Without using even a drop of LHe, the PanScan Freedom can offer low-drift, LT atomic resolution, low-noise and STS results. Superior versatility - The PanScan Freedom is offered in two formats - STM only or with both STM and AFM capabilities. STM probes and AFM-qPlus1 are interchangeable in vacuums. qPlus1 sensors comprise a conductive tip for combined STM and AFM scanning methods. Superior STS results - The R9 control system is a current AFM/STM control system from RHK. It provides the latest R9 platform as well as all digital purpose-built hardware for the highest performance with the lowest noise. IHDL™ allows the simple drag-and-drop installation of hardware and experiment parts that connect and automatically validate. 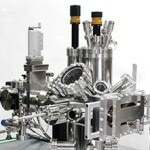 One-box integration facilitates complete AFM, STM and even KFM control. R9 operation – It is designed to allow not only high quality topographic images but also allows improved spectroscopic data. The R9 can alter bias modulation, feedback and other imaging parameters individually for both the spectroscopic and topographic measurements. LHe-free – No need for expensive liquid helium. No interruption - Cryogenic temperatures can be maintained for as long as required. Experimental flexibility is unlimited. Processes will not be hampered as liquid helium will not get depleted before measurements are completed. 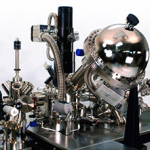 Excellent STS – Indefinite hold time allows a limitless number of spectroscopic measurements to be carried out without the need for halting and re-filling a helium reservoir; allowing spectroscopic measurements ranging from single I/V curves to complete spectroscopic maps. XY drift as low as 0.2Å/hour – The microscope along with its tip and sample can be maintained at the same temperature ranging between 15K and room temperature. Elimination of thermal gradients maintains a low drift over full temperature range. Z drift as low as 0.2Å/day – The low drift assists in producing excellent spectroscopic measurements. Feedback loops can be kept open for extended periods, without leading to any error in the measurements.